Before he was hired for his current job, he was a football player, a minister and a public speaker. While it might be difficult to identify his true calling, each one of those former occupations has influenced his current one. Or maybe Frank Reich is just good at whatever he sets his mind to. Recently, Reich was named the NFL’s AFC Coach of the Year. 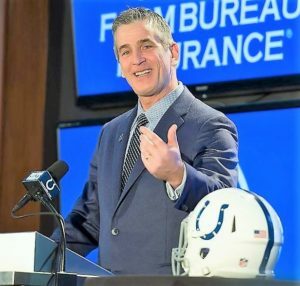 The award came following a spectacular season as the Cedar Crest graduate’s first year as the Indianapolis Colts’ head coach. Reich is the only Lebanon County native to ever ascend to the coaching pinnacle that resides only in the NFL. But more than that it is just the latest stop in the remarkable journey that is Reich’s life. “It was really neat,” said Reich. “To get AFC Coach-of-the-Year was a true honor. But any time you receive an individual award in this game, it’s an oxymoron. It says a lot about the success of the team. This was an incredible year. I always dreamed about having the opportunity to be a head coach in this league. The relationships I forged with everyone in the building, then to start the way we did and turn it around was really special. Realistically, it would be hard to imagine Reich and the Colts having a better season than the one they turned in this year. 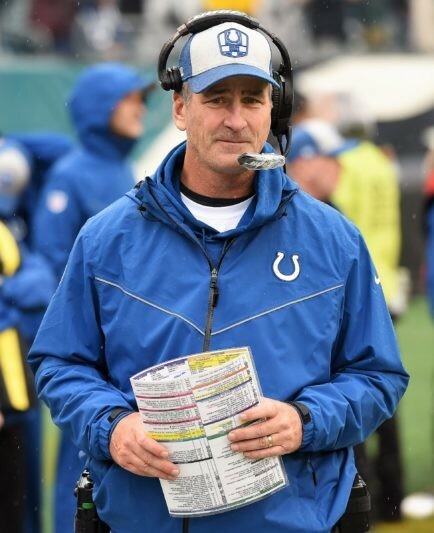 After helping to lead Philadelphia to the 2017 NFL championship as the Eagles offensive coordinator last February, Reich was hired as Indianapolis’ head coach. At the time, the Colts were coming off a 4-12 campaign. 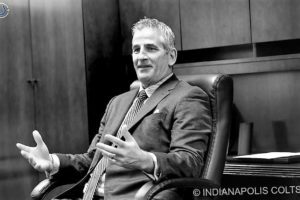 During the off-season, Indianapolis made some key personnel moves, which included a strong draft in April. The Colts improved the overall talent of their roster, especially along the offensive line and on the defensive side of the ball. Franchise quarterback Andrew Luck’s return to health was another key to the success. But Reich was the orchestrator. “One of the things I can say for sure is that I didn’t put expectations on number of wins,” said Reich. “We decided we weren’t going to surrender outcomes for process, and that we were going to believe in each other. When you get to 1-5 and say you’re not worrying about results, your thinking gets challenged. But we didn’t waiver. 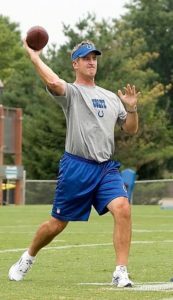 Things didn’t go well early on for Indianapolis, something that is not all that uncommon under first-year head coaches. The Colts lost five of their first six outings, including a somewhat controversial overtime loss to Houston in which Reich went for a win instead of settling for a possible tie. But throughout its early struggles, Indianapolis showed promise and improvement. While questions swirled, the Colts stayed true to the process, and most importantly to themselves. “There were multiple reasons for that,” said Reich. 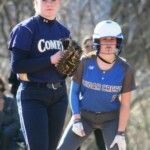 “There was an adjustment period, but we were learning and growing together. Even though we weren’t getting the results, we knew deep down inside that we were making progress. 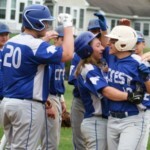 What it ignited was a streak of ten wins in 11 games, one which ultimately produced a playoff berth. The capper was a 33-17 triumph at Tennessee in Week 17 which secured what at one time seemed to be an unlikely postseason spot. In the opening round of the playoffs, Indianapolis dominated Houston 21-7. But for as inspiring as that win was, the 31-13 loss at Kansas City on January 12th was just as disheartening. Yet in the big picture, Indianapolis had become one of the NFL’s final eight teams still playing, in Reich’s first year as a head coach. The difference in the responsibilities for NFL head coaches and assistant coaches are glaring. 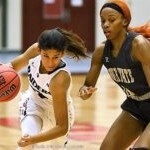 But perhaps the biggest difference is that ultimately everything – especially results – falls on the shoulders of the head coach. 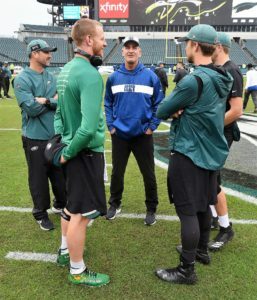 This season, Reich handled the all-important, in-game duty of calling offensive plays for Indianapolis, a responsiblity which he handled in San Diego as the Chargers’ offensive coordinator, but not in Philadelphia as the Eagles’ offensive coordinator. 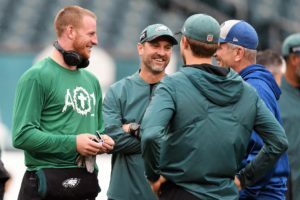 “I really enjoy calling plays, espcially when you have an offensive line like we have, and a quarterback like we have and play-makers like we have,” said Reich. “It’s fun to call plays when you have good players. I’m not going to give myself a grade on how I called plays this season. Because no matter what it is, I can do better. If you think Reich and the Colts are content to rest on their accomplishments of 2018 then you haven’t been paying attention. Make no mistake about the fact that Indianapolis’ goals revolve around winning a Super Bowl. But it would seem that the Colts are pointed in the right direction, that 2018 was a great foundation towards that end. Because 2018 was just a taste of what Reich and the Colts can accomplish.